Small garden ideas, balcony,container gardening You don't need a garden to garden. There are so many misconceptions about gardening. One being that you need a large space for gardening. However that is just not true. Even with limited space you can still bring nature into your home ,there are tons of small garden ideas for you to try. So do not let space put you off ! Anyone can garden. You don’t need much in terms of equipment or experience. It also doesn’t matter if you have never gardened before. 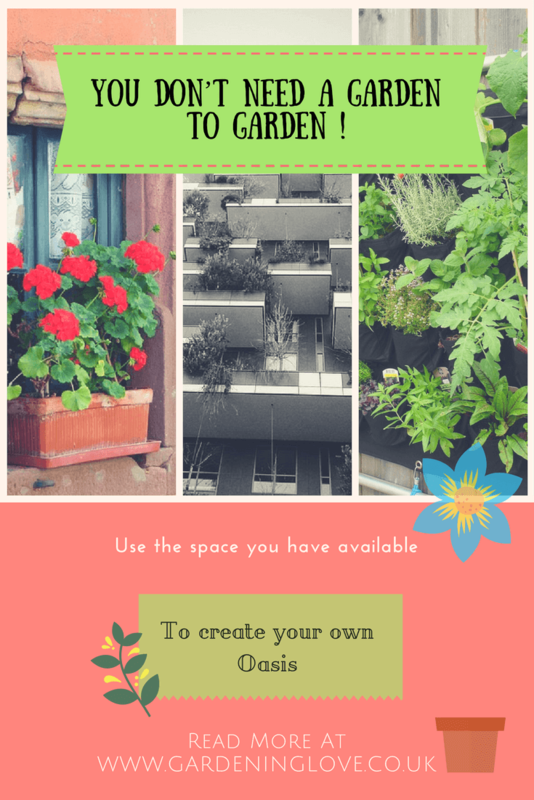 Coming up with ideas for small gardens doesn’t have to be expensive and will work in any space that you have available. You can garden with limited space, without having to have a regular outdoor garden with grass. Homes with patios, roof top apartments, twelfth story balconies or just a windowsill. There are so many different types of properties out there and of course, some wont have a conventional garden. But lets not focus on what space you dont have ! Lets make the most of what you Do have !!! Wherever you live, whatever type of home, you can still be a gardener. Your only limit is your imagination. A little creativity can go a long way. 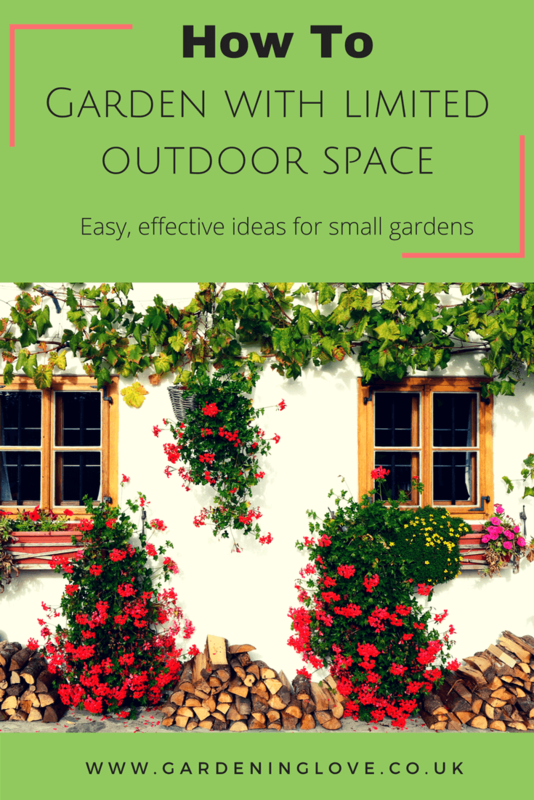 Lets have a look at some small garden ideas and see what we can do to utilise the space you DO have. So lets say you have no outdoor area to your home as such. You dont have a conventional garden with grass and flower beds. Ok….. do you have a windowsill ??? Line a few plant pots up and try growing some flowers from seed. All you need is a small bag of soil and a packet of seeds, follow the planting instructions on the packet. The light through the window will help to give decent growing conditions. If you grow from scratch it is very satisfying when you see what you have accomplished. If planting from seed is not your thing, there are plenty of ready grown potted plants that you could care for instead. Buying established plants can add an instant garden to your home. There really is something for everyone, and no, they are not that difficult to care for. Many people seem to think they are incapable of keeping a plant and will kill it at the first chance ! Some indoor plants, like Aloe Vera are very easy to care for and are a very healthy addition to your home. Anything is a potential plant pot with container gardening ! Any pot will do as long as it has drainage. Washed out tin cans make great plant pots. Just pierce a few holes in the base for drainage and paint the tin any colour of your choosing. If you want to decorate them further why not tie ribbon or lace around them. Go one step further and embellish them with buttons for a shabby chic edge. You could add tags or mini chalk boards with the name of each herb or plant on each one. If you do have some outdoor space, a balcony for instance. Planters can be a great option. There are many shapes and sizes of planters available and they come in many different materials from plastic to concrete. Those made from more natural materials such as terra-cotta, teak and cedar wood can look stunning against the colour of your chosen flowers. The natural option can help to bring a little more nature into your environment too which can be lovely if you live in the city and seem far away from nature. You can read all about the power of ecotherapy here. The great thing about planters and container gardening is that they are portable (although some of the larger ones can get heavy, ask a friend to help). You can move them about as and where you like. This can be handy if you have limited space. So if it’s a flower garden your after, a little vegetable patch or even both, you can have one right there on your balcony. Your very own patio paradise. Some planters can be pricey, if you are looking to keep the costs down. Why don’t you have a look around your home and see if there is anything that you can recycle. Try to keep an open mind as anything can be used within reason, just make sure you can add drainage holes. Things like old welly boots or shoes can look great. Make sure that you pierce some holes in the sole for drainage. Add a few stones inside to help weigh them down and fill with soil and plant your favourite flower. Be open-minded about old toys such as trucks, tea pots, cups etc, as they can all make fantastic planters. The options are endless and not only have you recycled and saved yourself a few bob, you have created a unique statement piece for your garden space. So you see, if you want to garden, you can. There are no rules really, give it a try, experiment with different ideas and plants. If something doesn’t grow or turn out right, you can always try something else. It is the desire to garden which makes us gardeners. If you try any of the small garden ideas mentioned, let me know how it goes.